Today's post is brought to you by my favorite friend, Miss Confianza. Yes, she's back in town and I was happy to see her this morning and welcome her with open arms! "Oh why not...today I'm doing a WIWW post. Let's show 'em what a visit from Confianza can do!" "We're going outside! Let's take pictures of me!" He did pretty good, huh? And Confianza showed through and through. When I walked into the office with Confianza. As soon as I walked in, I got whistles and "hi there good-lookin'!" from my gals in the office. Makes a workin' momma feel awesome! Yup, Confianza needs to visit way more often. I love when she comes around. linkin' it up here, of course! what a good friend this miss confianza is! As I said this morning when you text me, you look wonderful, beautimous and loverly! You even look happier today. I about cried when I read "my favorite friend" whew... I was going to have to comment.. "Wait! I'm the favorite friend sucka!" Thank goodness I didn't have to embarrass myself! (wink) Loves you my Nay! 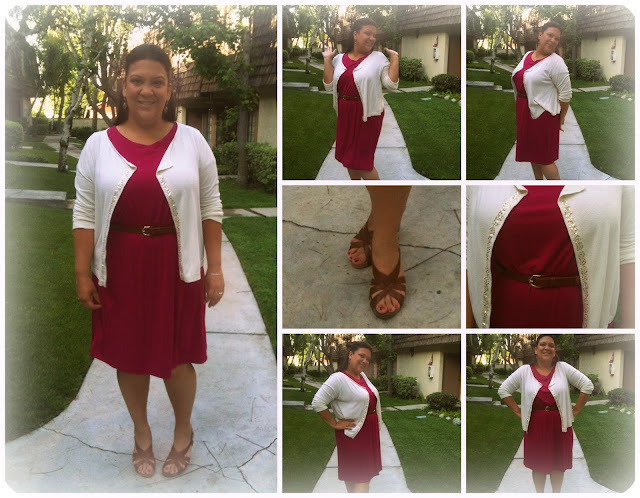 I am loving your cardi and your your "confianza" is certainly glowing! :) It was so good to meet you on Saturday. You are the sweetest! You're a total hottie! Love you in that color. Hello hot stuff!! Love the whole outfit! And yay for rockin some fierce confidence Nay! I love it and you! You look great, Nay!! Rockin' it! And I love those shoes!